The January/February 2010 issue of Moment Magazine features an interview with the indefatigable Paul M. Bessel. 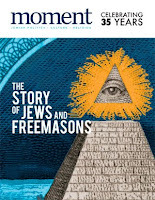 Beyond Dan Brown's The Lost Symbol: The True Story of Jews and Freemasons discusses the early participation of Jews in early English and American lodges. Masonic philosophy drew on ideas from many religious traditions, and its adherents were remarkable—with the occasional exception—for welcoming members of all creeds, affording them a path of social mobility. This was the case for many Jews in Western Europe. The first Jewish Mason was recorded in England in 1732 and by 1793, an entire Jewish lodge was established in London. Freemasonry became popular in colonial America, where the Freemasons’ self-described mission to “make good men better” resonated, and Masons played a vital role in the founding of the United States. George Washington, Benjamin Franklin and other Founding Fathers were Masons, as were prominent Jewish figures such as Haym Salomon, the prime financier of the American Revolution, and merchant Moses Michael Hayes, who was the Grand Master of the lodge where Paul Revere served as Deputy Grand Master. Other notable Jewish Masons range from British philanthropist Moses Montefiore and Hungarian-born illusionist Harry Houdini to American composer Irving Berlin and Samuel Gompers, founder of the American Federation of Labor (AFL). There have been 51 Jewish Grand Masters in the United States, and Israel itself is home to 60 Masonic lodges. Brother Paul goes on to briefly talk about the influence of Solomon's Temple on Masonic ritual, and several other topics. He is from Washington D.C., and his website contains the largest source of Masonic statistics anywhere. It is truly a labor of love. Paul is the author of Masonic Questions & Answers and co-author of Out of the Shadows: The Emergence of Prince Hall Freemasonry in America, 200 Years of Endurance. with Alton G. Roundtree. And nearly anyone who has written a Masonic article or research paper in the last decade sooner or later has ventured to Paul's incredible website to help fill in details. He is truly one of the unsung heros of Masonic scholarship. "If you were a macher or “big-shot” in the Jewish community in Arizona and wanted to be part of a service organization you would look to be part of something like the Masons. And on the altar in the Masonic lodge there is a Christian scripture, a Koran and a Tanakh. The one at our local lodge is an Orthodox Birnbaum Tanakh. I actually teach a Kabbalah class that takes place at a Masonic temple and a few Masons come to the class. All the members of the Masonic group are very interested in my Jewishness." 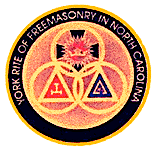 I'll have the honor of speaking at the 73rd annual Great Smokies York Rite Gathering in Maggie Valley, North Carolina. The event runs from Saturday, July 10th through Tuesday, July 13th. On Monday July 12th, the gathering will be addressed by Grand Master of Masons in North Carolina, William L. Dill, Past Grand master of Arizona Rex R. Hutchens, and myself. Tuesday's session will feature Thomas W. Jackson, Past Grand Secretary of Pennsylvania. There is a call for Candidates and Degree Teams to attend the 5th Annual Southwest Scottish Rite Regional Reunion, hosted by the Phoenix Valley, May 12th—16th, at the Chaparral Suites in Scottsdale, Arizona. This will be a unique opportunity for the Southwest Orients of the Southern Jurisdiction of Scottish Rite Masons, (Arizona, California, Colorado, Nevada, New Mexico and Utah) to hold a combined Reunion by gathering together to confer all twenty-nine Degrees upon worthy Candidates, as a courtesy to their home Valleys. The 2009 event, held in Long Beach, California, conferred the Scottish Rite Masonry Degrees to over 65 Candidates from multiple jurisdictions. All 29 Degrees will be exemplified, but the organizers also have special dispensation to have a Louisiana Degree team perform the Scottish Rite 1st, 2nd and 3rd Degrees on the evenings of May 12th and 13th for all interested Master Masons. These degrees are rarely seen outside of Louisiana, and are unique in U.S. Freemasonry. 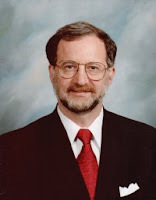 Cornerstone Book Publishers' Michael Poll, 1st Vice President of the masonic Society, will be a featured speaker. An outdoor Western BBQ is being planned for Friday Night the 14th. The Reunion will culminate with a Banquet on Saturday night, and will include a special Native American Powwow dancing entertainment. Phoenix Scottish Rite Bodies has obtained a reduced rate at the Chaparral Suites Resort in downtown Scottsdale. The rate of $129.00 per room includes breakfast and a free cocktail hour from 5:30 pm until 7:30 pm. Contact the Chaparral Suites at 5001 N. Scottsdale Rd. Scottsdale, AZ 85250, (480) 949-1414 / (800) 528-1456 or by e-mail at, www.chaparralsuites.com and request lodging under the code “Scottish Rite Regional Reunion”. Pennsylvania has always had one of the largest memberships in the U.S., for more than 250 years. But their ritual and rules are very different from any other masonic jurisdiction. If you ever have the opportunity to visit a Pennsylvania Master Mason degree, go out of your way and take the extra effort to do so. Freemasonry in the Keystone State has always been strict as far as their practices go. No written rituals—all work is mouth to ear, and the W∴M∴ does almost all of the speaking in all three degrees. Pennsylvania has rarely succumbed to one day classes, and never allowed even limited solicitation. Well, much of that is changing this year. R∴W∴B∴ Thomas K. Sturgeon, Grand Master for 2010/2011 has announced an ambitious slate of changes for the upcoming year, under the aegis "21st Century Renaissance." There is much more, and the entire program can be read here. This is the most formidable outline of reforms and changes I have ever seen a grand master propose all at one toss. I am sure there will be grumbling across Pennsylvania, but Grand Master Sturgeon and his fellow officers have obviously been thinking long and hard about ways to face the challenges all jurisdictions are confronting. The "Laudable Pursuit" generation of grand lodges officers are moving into the top positions all over the country, and are at last making the changes needed to adapt to the new century. In case you think Freemasonry never changes, we are living through a momentous time in the fraternity, with greater experimentation going on than at any other moment in history. Power is being devolved to the lodges, and grand lodges are removing barriers to new methods of holding meetings, teaching, learning and operating. We live in exciting times. I'll be curious to see the reaction of Pennsylvania brethren. Thanks to Brother Lee Martin for the heads up. Back from a great evening in downtown Indianapolis. The annual Feast of St. John at Indiana Freemasons' Hall was attended by more than 80 brethren, and was hosted by Centre Lodge No. 23. Many thanks to W∴B∴ Greg Kitzmiller, the new W∴M∴ for 2010, and all of his officers and brethren. At least a dozen lodges, including several Prince Hall brethren, were represented at this year's dinner. Our speaker for the evening was R∴W∴B∴ Richard Elman, Past Grand Master, and Indiana's new Grand Secretary, as of this week. The food was hearty, the fellowship was outstanding. Many thanks to everyone who made this an evening to remember! 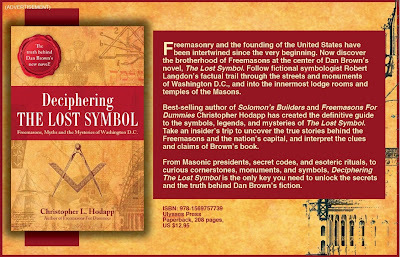 I have received several notes from folks asking about the delivery date for Deciphering The Lost Symbol. Unfortunately, while the publisher had first said it would be in stores before Thanksgiving, and then before Christmas, both Amazon and Barnes & Noble are saying January 1st. My apologies to folks who expected the book in time for the holidays. I assure you, so did I. QUEST, the Grand Lodge of New York’s Queens District’s annual Masonic education seminar, will celebrate its 30th anniversary on March 13, 2010. 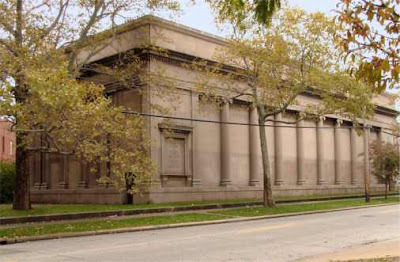 QUEST meets at the Advance Masonic Temple, located at 21-14 30th Ave. in Long Island City. The day will begin at 9 a.m. and should conclude at 1:15. Breakfast will be served at 8, and lunch at 12:15. Among the speakers scheduled to appear is MW Edward Gilbert, Grand Master of New York, who has been recovering for several months from some health troubles. The keynote speaker will be MW Richard Fletcher, Past Grand Master of Vermont and Executive Secretary of the Masonic Service Association of North America. 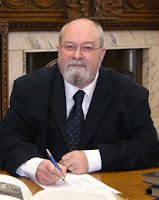 The speaker during lunch will be MW Gary Henningsen, Past Grand Master and Past Grand Secretary. I had the honor of speaking at this event last year, and it is truly an outstanding gathering. Don't miss it! After just a year and a half, the Masonic Society is approaching 1,000 members from all around the world. Our Semi-Annual meeting in Indianapolis in October was a great success. We are planning our second annual gathering at Masonic Week in February, and will soon be announcing that program. And we continue to offer what we believe to be the best Masonic magazine available anywhere. 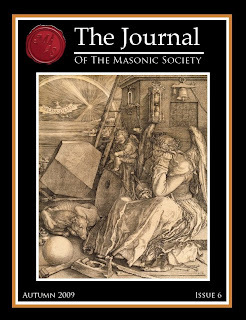 Issue 6 of the Journal of the Masonic Society has been slowly inching its way into mailboxes for the last two weeks. Plus new member benefits, Society News, Masonic news from around the world, Masonic Treasures, and more. Don't forget that the Journal also offers advertising for products of interest to Freemasons, with some of the best ad rates you'll find anywhere. Remember that we are especially interested in helping research lodges by giving your members' original work a wider audience. And a membership in The Masonic Society is a great idea for new Masons. At just $39 a year, members receive a beautiful wax-sealed patent, membership card, lapel pin, and four issues of the Journal. If you aren't a member, join today! Membership is open to all regular, recognized Master Masons. See the website for more details. In her article in the Muskogee Phoenix last Sunday, Bringing Back A Treasure, author Wren Stratton makes a profound statement: "It must have been quite a leap of faith in 1926 to build our Masonic Temple." 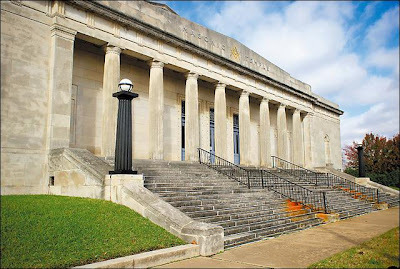 Her article describes with care the details of the Muskogee, Oklahoma Masonic Temple, with its stage and dance floor, and the decades of memories it has created for Masons and the whole community. And it tells the story so many of us have seen happen over the years with our temples. Membership numbers fell, brethren moved to the suburbs. Other charities took precedence over maintaining and improving our own buildings. Other more modern facilities lured events away from our magnificent places because of our failure to air condition them and put in elevators and wheelchair ramps. And finally, the generation that grew weary over leaky roofs and antique boilers looked for any possible offer to unload what they regarded as an expensive eyesore. Too many of our irreplaceable temples fell to the wrecking ball because of poor planning and a refusal to recognize that it takes work to keep these places alive. Like so many stories across the country, Ms. Stratton finds a small group of excited Masons who are looking to the future, who recognize the worth of these temples, and who are looking for ways to save them. The story is repeated in dozens, if not hundreds, of towns across the US and Canada. Decades of neglect cannot be fixed by raising the per capita of renters by $10 a year. Air conditioning a building the size of Muskogee's will take a couple of million dollars, as it did in the New Castle Scottish Rite Cathedral in Pennsylvania, or as it is estimated for Indiana Freemasons Hall in Indianapolis. Modernizing the stages, lighting, electrical, plumbing, and the rest will take millions more. Talk of raising millions during a recession is crazy. Like the two-year recession that began in 1910, during which the Scottish Rite broke ground for the House of the Temple in Washington DC. Just like the Scottish Rite was crazy in Indianapolis when they built the world's largest Scottish Rite Cathedral between 1929 and 1930, after the Great Depression hit. It was worse than crazy. A new generation of men are arriving in the fraternity every day, a generation that is asking uncomfortable questions about the dearth of Masonic education, criminally cheap dues, lousy food, bad ritual, dull meetings, and the rush to abandon the Masonic temples our grandfathers built for us and for our communities at great cost and sacrifice. They expected us to do even greater things, or to at least maintain what they left us. Once you’ve seen her, you can’t help but be caught up in the romance of the building. She is a grand old lady and deserves our love and attention. I guarantee if we could pull the money together, she would make a wonderful addition to the arts venues of Muskogee. Maybe just one step at a time. . .
She’s been watching, as Muskogee grew and changed. She has seen an entire generation of folks born and died. The temple is waiting patiently for her moment once again to hold her rightful place in our community as a source of beauty and pride. Artist Peter Waddell's 21 painting exhibition, The Initiated Eye, comes to the Scottish Rite Northern Masonic Jurisdiction's National Heritage Museum in Lexington, Massachusetts. The exhibit runs December 19th through January 9th, 2011. The paintings were commissioned by the Grand Lodge of the District of Columbia, and have traveled the country. I was lucky enough to see them in San Francisco two years ago. 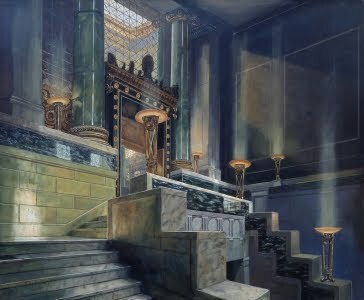 The paintings are based on the history and architecture of Washington, D.C., and the role that Freemasons had in the design and construction of the city. They feature famous Masons and Masonic landmarks in the nation's capitol. In Lexington, they will be accompanied by forty artifacts that will compliment them and help to illustrate the story of Freemasons in Washington D.C. I had the great opportunity a few months ago to read an advance copy of brother Michael Halleran's upcoming book, The Better Angels of Our Nature, his in-depth study of interactions between Freemasons during the American Civil War. The Better Angels of Our Nature accomplishes what few books about Freemasons are able to do: it explores the legends and long-told tall tales of the fraternity in an academic fashion, with both dispassionate analysis of the facts, and an obvious passion for the subject. Personal accounts from the Civil War have the effect of personalizing the experience, instead of being able to hold it at a polite distance, perhaps because it was the first war that had, not just commanders, but so many enlisted men educated enough to write letters and diaries. Along the way, Michael shatters several longstanding and cherished Masonic fables, but he reinforces and illuminates far more than he buries. The result is a strong affirmation of the bond between warring Masonic brethren, in the war that brought more of them together on opposing sides than any in our history. Halleran's title comes from Abraham Lincoln's inaugural address on March 4, 1861, as he argued passionately before his audience and the nation to keep the Union together. Intelligence, patriotism, Christianity, and a firm reliance on Him who has never yet forsaken this favored land are still competent to adjust in the best way all our present difficulty. Available March 2010. 232 pp. Registration of Elected Officials Comes to Rome: The Freemasons Will "Unveil"
Rome (December 11) - In Rome, there will be established the public registration of elected officials: advisors and assessors or persons named in municipal boards will have to declare membership of associations and organizations, including the Masonic ones. [There was a] violent reaction from the Grand Master of the Grand Orient of Italy, Gustavo Raffi (right), who spoke of profiling. The approved text was amended by the center-right majority. "The Nazis and the Stalinists did this," said Raffi, declaring "the most extensive protection in all locations." Commenting on statements made yesterday by Mayor Gianni Alemanno, that "the appointed and elected officials cannot belong to secret societies, whether Masonic or not," he remarked [that they] "smell of sulfur and echo, we would like to believe out of ignorance (in the Latin sense of the term), the ominous allegations of conspiracy theory, about Satanists, plutocrats, Jews, Freemasons, of sad and sickening memory." He repeated that "the Masonry of the Grand Orient of Italy of the Palazzo Giustiniani is not a secret society but operates in the sunshine." Alemanno: no aversion to the Freemasons. "I do not have any dislike of Freemasonry," said Mayor Gianni Alemanno. "Soon I will invite Grand Master Raffi to Capitol Hill to clarify any misunderstanding and to find a solution that ensures full transparency of elected officials [that does not] discriminate or offend any sensitivities and any culture." In particular, six of the seven amendments have been approved: those of the majority, the first signers Federico Mollicone and Andrea De Priamo, extended the registration in addition to those appointed to positions within the City and cultural institutions as well as [firms?] participating in the Municipality of Rome. Further, under another amendment, elected and appointed officials must declare their membership in "cultural and sports associations, charities, non-profit organizations, co-ops, Masonic organizations, foundations and any other form of public or private organization not covered by privacy [laws]." The first signatories Mollicone and De Priam said they were "willing to meet all associations, including the Grand Oriente, requesting them to explain that this obligation is exclusively cognitive." "We are pleased with the approval of the resolution - said the leader of the Pd Umberto Brown - because transparency is the cornerstone of participatory democracy and is the basis of a process aimed at increasing the involvement of citizens in political and institutions. The leader of the PDL Dario Rossin said that "the extension of the registry administrators, and also to be appointed is a choice that goes into the sign of a total administrative clarity to the citizens." So, as the European Union's Human Rights court previously rejected registration of Freemasons in Italy as being discriminatory, the city of Rome circumvents the law by demanding registration of all "cultural and sports associations, charities, non-profit organizations, co-ops, Masonic organizations, foundations and any other form of public or private organization not covered by privacy [laws]." To celebrate the 350th anniversary of the Royal Society in 2010, The Masonic Society, in conjunction with Library and Museum of Freemasonry, will hold their 1st Annual Uk –Ireland Symposium in London on Friday and Saturday 28th/29th May. On November 28th 1660, just months after the restoration of King Charles II, a select group of eminent scientist met to form ‘The Royal Society’. Their intention was to remove such limitations as language barriers in the scientific community and awaken the world to a new form of forward thinking science. This was meant to encourage the young men of the time to search for answers to many questions they had previously been afraid to ask. Now, nearly 350 years later, another group of men met to form an organisation with the aim of researching Freemasonry: The Masonic Society. The name, deliberately chosen, alludes to the Royal Society and the visionary men, many of whom were Freemasons, who were at the forefront of the Age of Enlightenment. The Masonic Society has plans to be at the forefront of a new age of Freemasonry. This first Symposium being held in England will have as its theme ‘The Royal Society’. The two selected speakers are well known historians: Michael Baigent (The Holy Blood and the Holy Grail, The Dead Sea Scrolls Deception ) will present ‘Aspects of the Royal Society’ followed by questions and answers and a complimentary lunch. The second speaker Robert L D Cooper (The Masonic Magician: The Life and Death of Count Cagliostro and His Egyptian Rite , The Rosslyn Hoax ) will talk on ‘A Scottish View of the Foundation of the Royal Society’. The afternoon will end with a second session of questions and answers. The whole day symposium will be preceded on the Friday by a private guided tour of their exhibition ‘Freemasons and the Royal Society’ (meet in the first floor lounge Freemasons Hall 4:00pm). This will be the last date of the exhibition which is being held between January 11th and May 28th 2010. The evening will end with an informal dinner and drinks at the popular Prince of Wales tavern on the corner of Great Queen Street. Freemason and Shriner Albert "Al" Hortman passed away on Sunday, December 6. He was 80 years old. There's no reason why you would know his name, although you have probably seen his image at some point over the last several decades. It has appeared in TV and magazine ads, on TV, even on the backs of semis driving down the interstate. Brother Hortman was the Shriner, wearing his fez, carrying a little girl and her crutches. At left in the original photo is his daughter, Laura, who was herself a patient at the Shriners Hospital in St. Louis. After Laura began receiving treatment at Shriners, Hortman decided to join the Shrine in 1968. The little girl being carried was Bobbi Jo Wright, who was also a patient at the St. Louis Shriners Hospital. Bobbi Jo went on to graduate from Anderson University in Anderson, Indiana, just up the road from my home, and where my wife and I had our business for six years. Bobbi Jo walks with a cane today, but she walks, thanks to Shriners. Brother Hortman served in the United States Army during the Korean War and received the Purple Heart. He was a member of Jeffersonville Lodge in Georgia, but before that, he was a resident of Evansville, Indiana. 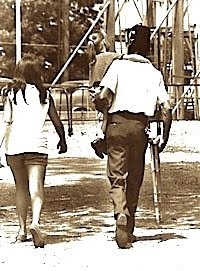 The photo was taken in 1970 by Randy Dieter, who was covering Hadi Temple’s annual outing for handicapped children at the long closed Mesker Amusement Park in Evansville, Indiana. 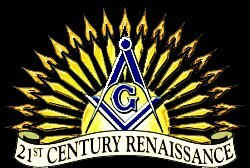 Like the more than two centuries of separation between black and white Freemasons, the appendant Masonic organizations followed the same path. The historically black Prince Hall Affiliated Shriners are the Ancient Egyptian Arabic Order Nobles Mystic Shrine, and are headquartered in Memphis, Tennessee. While they have contributed to the historically white Shriners Hospitals over the years, they are not officially part of the Ancient Arabic Order of Nobles of the Mystic Shrine, now known as Shriners International, based in Tampa, Florida. A year ago, the AEAONMS began a partnership with the American Diabetic Association as their predominant charity. The Prince Hall Shriners are headed to Tampa for their annual Imperial Session next year. In August 2010 an estimated 15,000 members are expected. In 1872, for fun and charity, the white Masons started a fraternity called the Ancient Arabic Order of the Nobles of the Mystic Shrine. The black Masons formed their own Shrine group in 1893, the Ancient Egyptian Arabic Order. Both groups referred to their chapters as "temples." Both called their leader "imperial potentate." They coexisted, sometimes in the same cities, for at least two decades. But then, the lawsuits began. In 1914, a white Georgia lodge tried to bar a black lodge from imitating its name, constitution titles, emblems and regalia. The same then happened in Arkansas. When a white Houston group sued its local black counterpart in 1918, the case expanded to include Shriner groups throughout the United States and landed in the U.S. Supreme Court. The legal battle lasted more than a decade. On June 3, 1929, the Supreme Court concluded that even though the black Shriners formed their group out of imitation, the white Shriners knew about the group's existence and didn't take legal action for years. In fact, evidence showed that the white groups sold their paraphernalia to black groups for ceremonial use. The black Shriners were not trying to pass themselves off as white Shriners and it was too late for the whites to claim the symbols as exclusively theirs. The black Shriners celebrate this decision every year. They call it the Jubilee Day. Eighty years later, Tampa's historically-black Harram Temple has no white members. The spokesman for the local historically-white Egypt Shrine doesn't think his group has any black members. Both groups say they would welcome a member of the other race. The racial divide happens naturally, not by exclusion, says Hillsborough County Judge Eric R. Myers, an officer in the black Shriners group. Think of college fraternities and sororities. Think of sons following in their fathers' footsteps. "Think about it across the board in a lot of organizations," he says. "Churches — come on, let's be real." Myers, who is slated to become the chief of the worldwide black Shriners group in eight years, said he was in charge of the local temple in 1995 when he met a member with the white Shriners temple. "Nobody had ever really talked to one another," Myers said. The white Shriners invited the black Shriners to their circus, and the tradition has continued ever since. The black Shriners are also nationwide contributors to Shriners Hospitals, the major philanthropy of the historically-white group. Eight years ago, the worldwide leaders of the white Shriners invited the leaders of the black group to their headquarters to trade ideas about attracting members and working together, remembers Jack Jones, imperial potentate for the historically-white group. That meeting concluded with an agreement that members of both groups could visit each others' temples throughout the organizations. "We do have good discourse with them," Jones says. "They work toward the betterment of mankind as well as we do." There are no serious discussions to fuse the two. What would happen to all those guys in line to become imperial potentate? "If you come together," said Warren Spears, spokesman for the worldwide black Shriners, "that means somebody's going to be on the short end." Expect to see much of what you saw three years ago in Tampa starting on Aug. 13 and lasting approximately a week. The city will be covered with red fezzes. The Daughters of Isis, the female counterpart to the black Shriners, will celebrate its 100th anniversary here during the convention. They're all planning service projects. Ybor City's Seventh Avenue will make way for a huge parade. And one of those days, maybe, the leaders of the black Shriners will visit the historically-white Shriners headquarters in Tampa to trade ideas again. The white Shriners say they plan to extend an invitation. 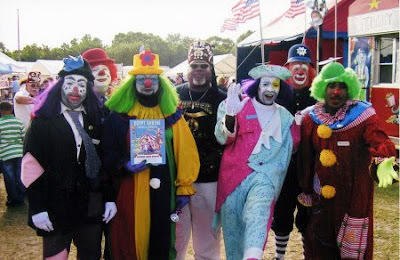 Photo from the St. Petersburg Times: Shriner clowns from the historically white Egypt Shrine and historically black Harram Temple appear at a bay area event. Now THAT'S a Masonic Building! 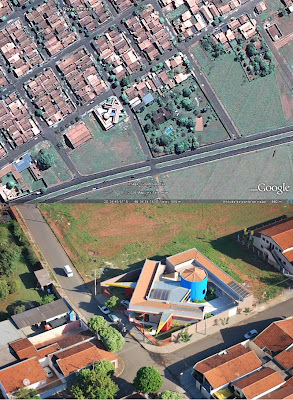 Masonic building ("Casa do Maçom") spotted on Google Earth in Nova America, Brazil at coordinates 20 34 45.51 S, 48 34 34.14 W.
The "House of Mason John Baroni" (Casa do Maçom Joao Baroni) offers lodging to Masons and their families from all over Brazil who undergo treatment at the local Cancer Hospital. 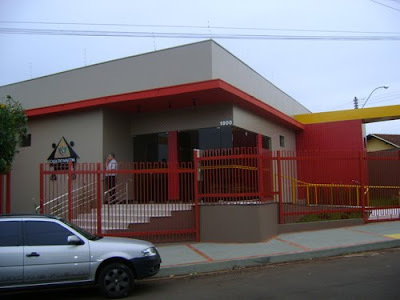 It is in Barretos, a suburb of Sao Paulo. It was constructed by the Grand Orient de Sao Paulo, and contains eleven furnished rooms for guests. From the street in a photo by Rodolfo Lomas. I'd like to speak to that architect. Broad Ripple Lodge needs a makeover. UPDATE: Video showing construction and interior guest rooms of Casa do Maçom here. The building was designed by André Ponciano.